Sudbury Steve May: Could Liberal MP's Rejection of the Budget Lead to the Rise of a Newfoundland and Labrador Party? Could Liberal MP's Rejection of the Budget Lead to the Rise of a Newfoundland and Labrador Party? And so it begins. Reports are coming out today that two Liberal MP’s are ready to vote against the Harper-Ignatieff budget when it comes to a vote. Both MP’s are from the Province of Newfoundland and Labrador, a province whose Premier is Danny Williams, who has been very vocal about the budget. Recall that immediately after the budget was announced, Danny Williams took to the airwaves and called on Ignatieff to defeat it. Looks like at least two of the six Liberal MP’s from Newfoundland and Labrador are heeding his call, even if their Leader Ignatieff isn’t. 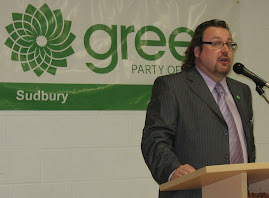 And why shouldn’t those MP’s in Newfoundland and Labrador listen to Williams? Certainly Williams’ A-B-C (“Anybody But Conservative”) campaign during the last Federal election contributed to the success of the Liberals (and NDP) in Newfoundland and Labrador. Aside from being one of the most anti-Harper public figures in the country, Williams is very concerned that the budget shorts his province about $1.5 billion dollars in equalization payments, as per the Atlantic Accord. Quebec Premier Jean Charest has also been grumbling about his province being short-changed as well. The difference is, in Quebec, there is a regional party on the national stage which always speaks out for the interests of that province, and Gilles Duceppe has been very vocal in his opposition to the budget already. Newfoundland and Labrador don’t have such a party. But it is interesting to wonder if they might in the future. Danny Williams has already been laying this groundwork. A fiscal conservative who largely believes in social equity, Williams has been at odds with Harper over Harper’s vision of small national government, particularly one which pays little or no attention to smaller players like Newfoundland and Labrador. With the help of the A-B-C campaign, voters in Newfoundland and Labrador returned results during the last Federal election which ran counter to national results, returning zero Conservatives to parliament. Now, with Liberal MP’s threatening to split ranks from a Liberal Party which has already started consolidating power in it’s Leader at the expense of the rank and file, can it be long before a Newfoundland and Labrador Party starts to take shape in that Province? Such a party would likely reflect Williams’ own mentality of fiscal conservatism. Think its far fetched? No way. There has always been a strong sense among many Newfoundlanders that Canada has really bungled the deal it made to bring Newfoundland into confederation. Although the collapse of the cod fishery is now old news, it is a glaring example of how Canadian mismanagement of a Newfoundland resource so critical to that Province’s well being (not to mention pride and heritage) has led to discontent with the national government. For long, such discontent boiled below the surface, bubbling up only occasionally. But with Danny Williams now on the scene, such displays of discontent are become more the rule than the exception. As Newfoundland and Labrador begins to explore its new self-esteem on the national stage, bouyed by increased oil revenues, it is finding its own voice. And it is finding that voice to be one which is often counter to the mainstream political parties in Canada. And I unfortunately have to include our own Party in that equation, for although Williams financial point of view might be a good fit with our Party, his environmental record leaves a lot to be desired. So, what could happen if we saw the rise of a new Newfoundland and Labrador Party on the national stage to advocate for the interests of that Province (whether within confederation or, like the Bloc, outside of it, remains to be seen)? Certainly such a party would continue to fracture the make-up of parliament, as it would likely be successful right away at putting MP’s in the House. Potentially, this could lead to a situation where the other political parties might have to work together even more, likely on a case by case basis, to further their own political interests. That likely means a greater chance that more formal coalitions might develop. If we Greens are thrown into such a parliamentary mix as well, by electing our own MP’s, the outcome would likely be more minority governments, more opportunities for coalitions of interest to develop, and a greater chance at finally reforming our electoral system. So, in this brief analysis, although the rise of a Newfoundland and Labrador Party doesn’t appear to help the Green Party, there may be some helpful impacts down the road. Unfortunately, I don’t see any immediate opportunities for the Green Party in Newfoundland and Labrador as a direct result of this budgetary mess. But I have to wonder, if Liberal MP’s in Newfoundland and Labrador are ultimately expelled from the Liberal caucus for voting against Ignatieff’s direction, how deep ultimately is their commitment to Stephane Dion’s platform on which they ran and were elected? As it seems unlikely that Ignatieff’s Liberals, or any other Party currently in parliament will be campaigning on the basis of an Income Tax shift to carbon revenue in the next election, might there be an opening for a Green conversion? And I don’t know enough about the personalities involved to make such an assessment. But I hope others start looking into it.